The Steamboat Springs Priory is located at the historic site of Steamboat Springs south of Reno, Nevada. The Priory is governed by a prior or prioress who is appointed by the Abbot of the Order. The main Priory building houses the Priory Chancery and Chapel, offices of the International Community Guilds, the Church's Health and Therapy Center, and the Steamboat Villa Hot Springs Spa. Several parsonages are located on the property, and ancillary buildings are put to use by various Church departments, including those for publishing, video and sound production. The property and buildings were gifted to the Church in 1986. 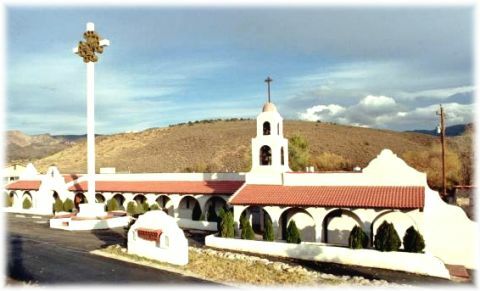 In 1987, the Church began remodeling the main Priory building into its present Spanish mission style. The addition of an arcade of ornamental columns and archways provides a shaded walkway across the front length of the building. The interior continues the mission style with wood and stucco and arched doorways and halls throughout. The Chancery and Chapel are located in the main Priory building and form the religious and administrative nucleus of the Priory. The Chapel of the Roses fulfills a special liturgical use within the Church, providing a place for worship, reflection and reading for members of the Order who reside at the Steamboat Springs Priory. Its columned archways, reader stands, seats, and communion table are trimmed and finished in mahogany, oak, and black marble. The walls and arches are finished in stucco in keeping with the mission style of the entire Priory complex. The Church maintains a Health and Therapy Center at Steamboat Springs. An historic site listed on the State Register of Historic Places, the area is said to have been named by Mark Twain during his stay in Virginia City in the late 19th century. Native Americans used the site for hundreds, perhaps thousands, of years. Both the Paiute and Washoe Indian tribes maintained winter settlements in the nearby area. Steamboat Springs, Nevada, is one of the most continuously active natural geothermal areas in the world. Its artesian waters are high in mineral content, several of which are rare. It was the Paiute who first introduced European settlers to the rejuvenating mineral waters. A popular resort during the days of the Comstock Lode, Steamboat Springs was later developed for therapeutics in the early 1900's. The Church hopes to expand the existing facilities at Steamboat Springs into a world-renowned healing center. A development plan that will include medical and fitness facilities; meeting space; shop for health products, minerals and gems, handmade items such as jewelry and pottery; restaurant, lodging, and equestrian recreation is on the drawing board. The Church's concepts of health and therapy are based on religious teaching--the foundation of many healing centers of ancient spiritual temples such as those in Egypt, Greece, India, China, and the Americas, among other areas of the world. Highly sophisticated techniques based on the arts and sciences of light, color, sound, water, aroma, and herbal therapies will be used for mental, emotional and physical health. Above all, the Church emphasizes the health of the spirit and soul, as all other aspects of health derive from spiritual wellness. The Steamboat Villa Hot Springs Spa is a facility of the Church's Health and Therapy Center and offers to the general public use of the geothermal steam and mineral water unique to this region. Eight individual tub rooms, steam room, outdoor pools, massage, body wraps and other therapies are offered. For the convenience of guests, there is a fresh-water shower in each of the private tub rooms, along with colored lighting and stained glass windows for color therapy. A sound system provides speakers in each room for optional listening. Tub rooms and steam sauna are tiled in white tile. Redwood benches provide comfortable seating. Hallways and portions of the tub and steam rooms are tiled with handmade Mexican terra cotta tile in keeping with the Priory's mission style. Please visit the Steamboat Villa Hot Springs Spa on the World Wide Web.